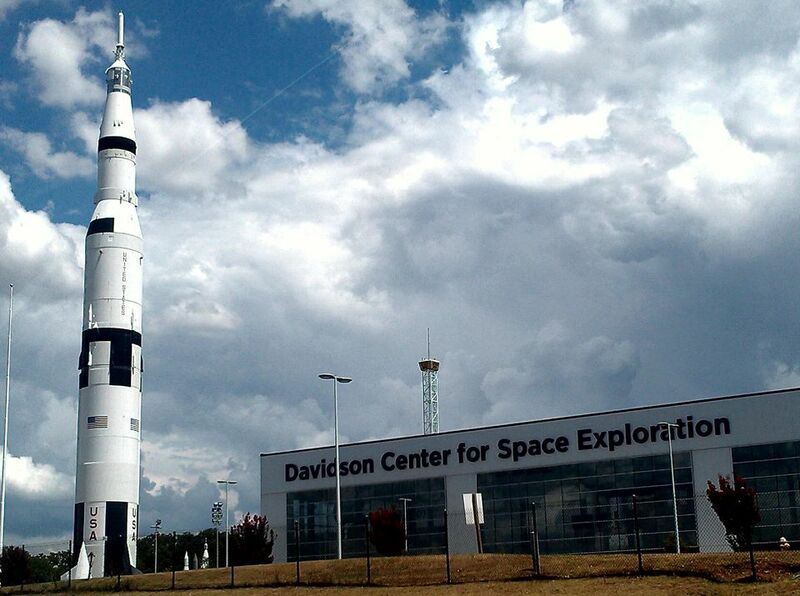 The U.S. Space and Rocket Center, located in Huntsville, is Alabama's top tourist attraction among attractions that charge admission. The Center, which opened in 1970 as NASA's first visitor center, includes a museum, Space Camp, Aviation Challenge and X-Camp. Also part of the complex, an Education Training Center houses the U.S. Space & Rocket Center's Education Department and Marshall Space Flight Center's Educator Resource Center. The U.S. Space and Rocket Center is a state agency of the State of Alabama. The museum, which serves as the visitor information center for Marshall Space Flight Center, achieved Smithsonian Institution Affiliate status in 2002. Saturn V, displayed in the museum's immense Davidson Center, was the first Saturn V to be displayed publicly and is the only one designated as a National Historic Landmark. It is also listed as a National Historic Mechanical Engineering Landmark. The ​U.S. Space and Rocket Center Museum opened in 1970 as a permanent exhibit for the hardware of the space program. The project was spearheaded by Dr. Wernher von Braun (1912 – 1977), one of the most important figures in the development of space exploration and the first director of NASA's Marshall Space Flight Center. In 2008, the Davidson Center opened providing 68,000 additional square-feet of exhibit space, enlarging the total exhibit space within the U.S. Space and Rocket Center complex to over 100,000 square feet. The USSRC is open every day of the year except Thanksgiving, Christmas Eve and Christmas Day, New Year's Eve and New Year's Day. Hours are 9 am to 5 pm. Admission is charged: Individual Tickets, Combination Tickets, and Group Tickets may be purchased. Parking for visitors is free. To get the most out of your visit and avoid potential disappointment, visit the USSRC website (see below) to learn about the requirements for several of the most popular attraction (some have height, weight or other restrictions) and to determine the best ticket option for your family or group. Because the exhibits and attractions are both inside and outside, remember to dress accordingly. Huntsville's average summer temperatures sometimes top 90 degrees during the hottest months and winter temperatures average as low as 31 degrees in colder months. As with any sightseeing outing, plan your day to pace young children. Plan a snack and/or lunch break and consider an IMAX movie for some quiet time. Visitors to the U.S. Space and Rocket Center are able to see thousands of artifacts and enjoy dozens of interactive exhibits, while exploring the historical timeline of the U.S. space program, including the making of the moon rocket, the space race, the Apollo missions, the Space Shuttle program, the International Space Station and the beginnings of NASA's Constellation project. The Davidson Center - Described as the front door of the USSRC museum complex, the Davidson Center is 476 feet long, 90 feet wide and 63 feet high. The centerpiece, suspended 10 feet above the floor and displayed horizontally, is the Saturn V 500D/F moon rocket. Other exhibits tell the complete story of the Saturn program and explore lessons learned during the Apollo program. A few of the historic artifacts on display are the Apollo 16 capsule, space suits, a lunar rover and lander, and a moon rock obtained during the Apollo 12 mission. Interactive Attractions and Simulations - Several hands-on exhibits and space travel simulations engage visitors of many different interests and ages. Some of these experiences have height, weight, age or other requirements; therefore, it is a good idea to visit the USSRC website ahead of your visit (see below) to learn about the requirements for each attraction. Space Shot - Rocket 140-feet straight up in 2.5 seconds and experience weightlessness followed by freefall. G-Force Accelerator - Spin at approximately 24 revolutions per minute and experience three times the force of gravity. Kids Cosmos Energy Depletion Zone - Children under the age of 8 accompanied by an adult are able to enjoy interactive fun in the Space Station. Apollo Cockpit Trainer - Experience what it is like to be inside the Command Service Module on an Apollo mission to the moon. Mars Mission, Mars Climbing Wall - Learn about the red planet and scale part the tallest volcano in the solar system on the Mars Climbing Wall. Rocket Park - Rocket Park, located behind the museum, is home to an amazing collection of U.S. Army missiles and NASA rockets, plus the accurately depicted re-creation of Tranquility Base, where Apollo 11 landed on the moon. Shows and Movies - Discovery Theater offers daily live shows included in the price of admission. The six-story Spacedome IMAX Theater features a large domed screen for full-length movies and space-related IMAX presentations. Tickets for movies are additional or may be purchased as part of a Combination Admission Ticket. In addition to offering an interesting museum experience for a day-visit, the U.S. Space and Rocket Center complex is home to the facilities for Space Camp, Aviation Challenge, X-Camp and the Educator Resource Center. The Space Camp program, which launched in June 1982, attracts applicants from all 50 states and about 35 other countries each year. Educational programs take place most months of the year and offer a variety of options, including residential and day camps for children and adults, as well as programs for blind, visually-impaired, deaf and hard-of-hearing attendees. Aviation Challenge - Aviation Challenge explores military aviation through educational programs for many different age groups. Journey To Outer Space -- in Peoria, Arizona!